I've become quite the fan of Simon Pegg comedies over the years. And yes, I understand the difference between any regular movie that features Simon Pegg versus one that was directed by Edgar Wright and just happens to star Simon Pegg as the lead. And on his own, Simon Pegg is still a rather entertaining actor, especially in the realm of comedy. Somehow A Fantastic Fear of Everything managed to slip past my radar for some reason. I guess it's because it was primarily released in the UK and it only got a limited release in the US earlier this year. But it's certainly quite the clever movie and not the run-of-the-mill movie fare by any standard. I think it's safe to say that I enjoyed it. But at the same time I'm also still trying to figure out all the different bits involved in the movie and which parts I really liked and the ones that need more consideration. There's a decent comedy just on the surface of this movie - but there are also other aspects to things under the surface, if you choose to dig a little deeper. Synopsis: A Fantastic Fear of Everything is a 2012 comedy-horror movie written and directed by Crispian Mills with co-director Chris Hopewell. It was based on the novella Paranoia in the Launderette by Bruce Robinson, who in turn was the writer-director behind Withnail and I.
Jack (Simon Pegg) is an unpublished children's author who is currently rather paranoid about a lot of things. It doesn't help that he now lives alone after his divorce and his current project involves a series of scripts called "Decades of Death" that tackles the lives of various Victorian-era serial killers. Now he in turn is also obsessed with murder and the possibility that someone plans to kill him. And as is the way of things, the current news is that a serial killer known as the Hanoi Handshake Killer is active in their area. He lives an isolated life, all alone in his home with pretty much just his imagination to keep him company. But then his agent, Claire (Clare Higgins), calls with good news - the BBC is interested in picking up his script for "Decades of Death". But now he needs something proper to wear and he's deathly afraid of the launderette for some reason. And if he can manage to get out of the house, get things done at the landrette and make it to the meeting, he still has his inner demons to deal with including the wild theory that just about anyone - including the man he is scheduled to meet - might be someone out to kill him. I can imagine how much of a challenge this movie was for Simon Pegg since a lot of it relies on him and him alone. What really sells this story is his palpable fear as seen in scene after scene after scene. And while it as at times comedic, there those wonderfully crafted moments when we can't help but wonder if we just saw something move in the shadows or the itch at the center of your back that feels like someone is watching you. And this was achieved through the the brilliant tandem of actor and director working together to achieve a particular result - and one that I think they managed to bring to life on the screen. But at the same time, the movie leaves you wondering how you're supposed to feel - are you supposed to be scared or are you supposed to be amused? The movie dances between the two, but tends to stay really close the edge border between the two more often than not. I kind of get intellectually what they were hoping to achieve to some extent, but then again the problem is that the movie didn't make me feel it - I didn't truly experience what my brain was sort of mapping out. The movie had interesting moments and interesting bits of writing. But at times it does feel like they had to stretch things a bit given the source material was a little shorter than desired. At least that's my theory. Normally adaptations suffer the opposite problem - too much source material resulting in a lot getting cut out. Here I'm not quite sure if we ran out of content or if they just weren't sure what story they wanted to tell. But I must give credit to the stop-motion animation bits that helped depict Jack's little storybook world for "Harold the Hedgehog". Those were just lovey. 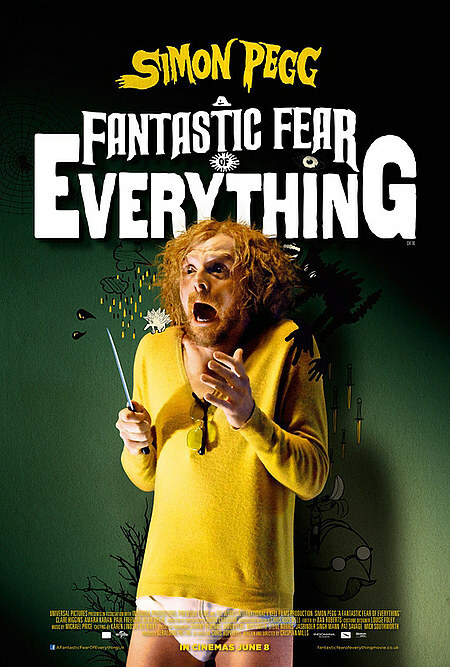 A Fantastic Fear of Everything is not my favorite Simon Pegg movie, but I think it did a little better than what some critics say. Thus in my opinion, the movie still deserves a decent 3 ridiculous situations resulting from superglue out of a possible 5.